Hjalmar Munsterhjelm (1840–1905) is an icon of Finnish landscape painting. The exhibition at Hämeenlinna Art Museum showcases some of the most important and best-known works created by this well-loved artist. Hjalmar Munsterhjelm’s highly atmospheric depictions of rural life, lake scenes, snow-covered islands and moonlit nights continue to delight art lovers and collectors to this day. Munsterhjelm was a pioneer of Finnish landscape painting and the first to place a significant focus on wintry scenes. In addition to Finland, he also painted the lush scenery surrounding Düsseldorf and the soaring mountainscapes of southern Germany. Hjalmar Munsterhjelm was born in Tuulos, Hämeenlinna. He was one of the first Finnish artists to study in Düsseldorf and played an active, high-profile role in the art scene at the time. The Hjalmar Munsterhjelm exhibition continues our series of exhibitions focusing on iconic Finnish landscape art. The exhibition will be accompanied by a book exploring the life and art of Hjalmar Munsterhjelm, written by Dr Teppo Jokinen, Professor Ville Lukkarinen and Curator Anne-Maria Pennonen. 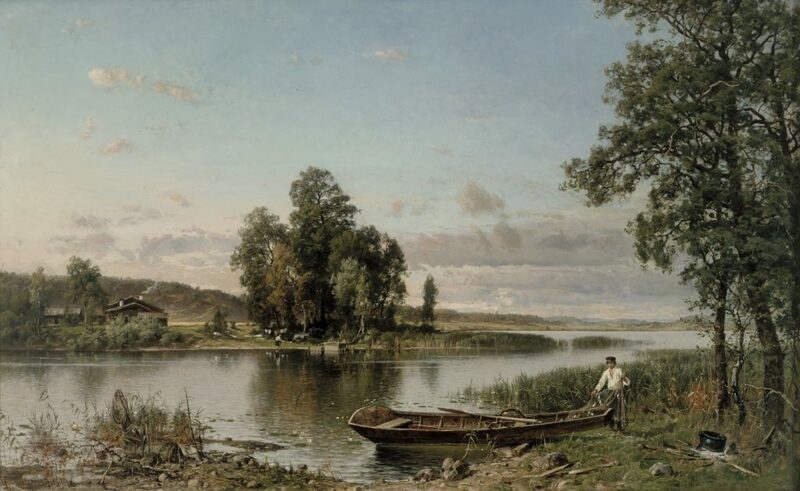 Hjalmar Munsterhjelm, Lake scene in Häme, 1884, The Office of the President of the Republic of Finland.